Each dog kennel anchor kit includes four anchors, a drive rod, and four wire rope clamps. This prepackaged kit requires no digging and is excellent for anchoring dog kennels, playground equipment, trees, fencing and more! Step 1 Move dog kennel to the area where it is to be anchored. Step 2 Begin by gathering one anchor, the driving rod and a large hammer (5 lb. Sledge works best). Begin at one corner of the kennel. 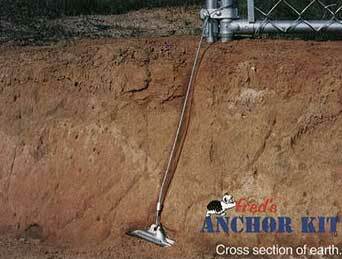 Insert the driving rod into the anchor and begin driving the anchor next to the bottom corner rail of dog kennel. Step 3 Drive the anchor down to the desired depth being sure to leave enough of the cable above ground to secure around the kennel frame. Step 4 Remove the driving rod. Wrap the exposed wire around the driving rod and pull upward four to five inches to "lock" the anchor into the ground. Step 5 After the anchor is “locked”, gather a wire clamp and wrap the wire around the corner vertical frame rails of the kennel so that the wire clamp will be to the outside of the kennel. Attach the wire clamp around the wire and tighten. Step 6 Repeat the above steps for the remaining corner of the kennel. Note: All underground work requires proper safety and location procedures. Do not install anchor kit until you know what is below the surface. It is important that all anchors be fully locked before being put to use.